With Back to School just around the corner, why not get an early start and do a fun, little DIY project? We've all seen those Back to School Survival Kits that you can make to give to teachers, but this unique kit is sure to grab some attention. First of all, who knew you could buy brand-new, empty paint cans? When I discovered this, I just knew I had the perfect use for one of those shiny pails. 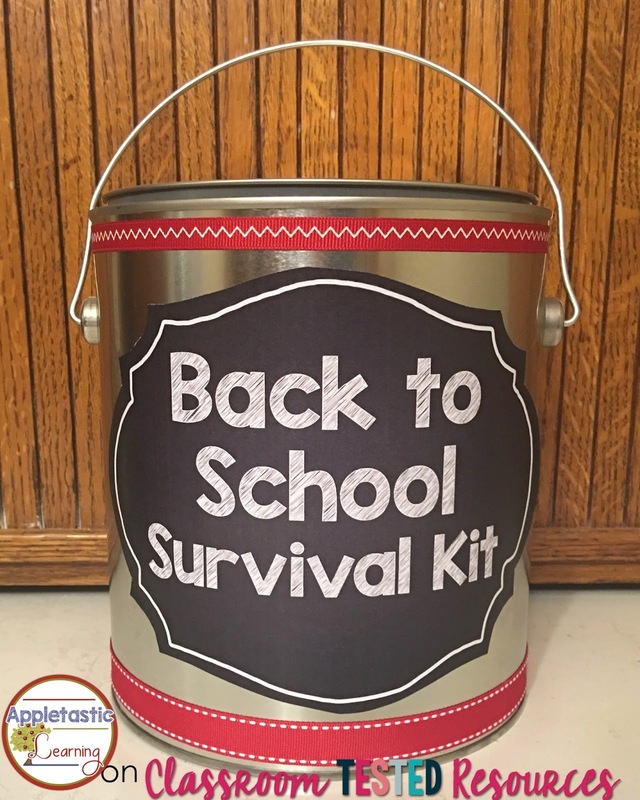 Just look at this oh-so-inviting Back to School Survival Kit! A new, unused, empty paint can (I bought mine at my local Home Depot). 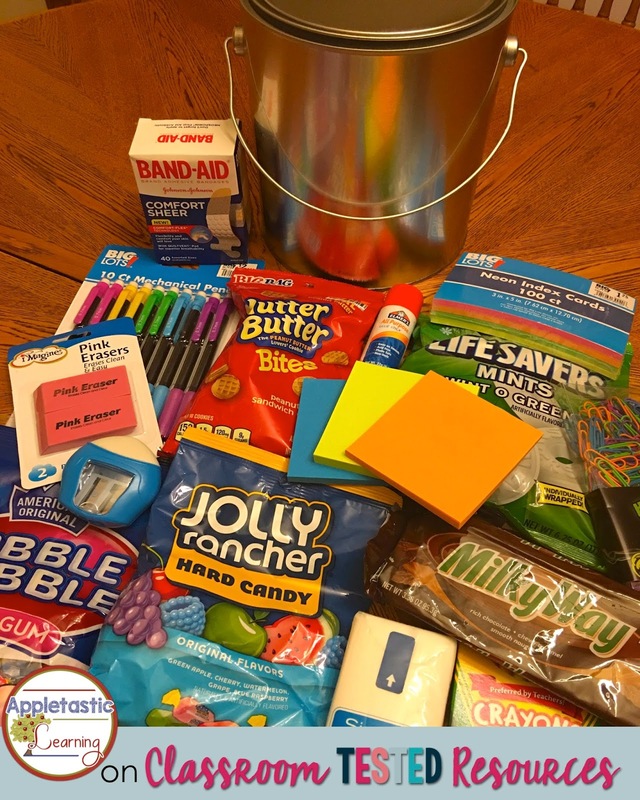 Candy, school supplies, treats. 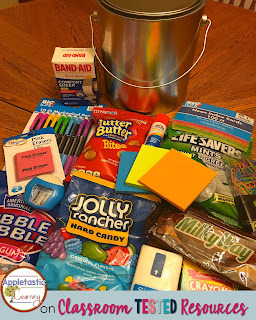 I included bubble gum, band aids, crayons, glue stick, travel size kleenex, life savers, paper clips, index cards, post-it notes, Milky Way, Jolly Ranchers, Nutter Butters, pencils, pencil sharpener, and erasers. Assembling your kit is quite simple, once you have gathered your supplies! First cut out the paint can label and the Note to Teacher. You can create your own, or feel free to download the FREE labels as shown in the photo. Next, start packing the items into the paint can. At first glance, it looks like you won't be able to fit everything in the can. With some careful packing, though, it can be done. Just be sure NOT to forget your list of contents and their meanings in the can before it gets too full! 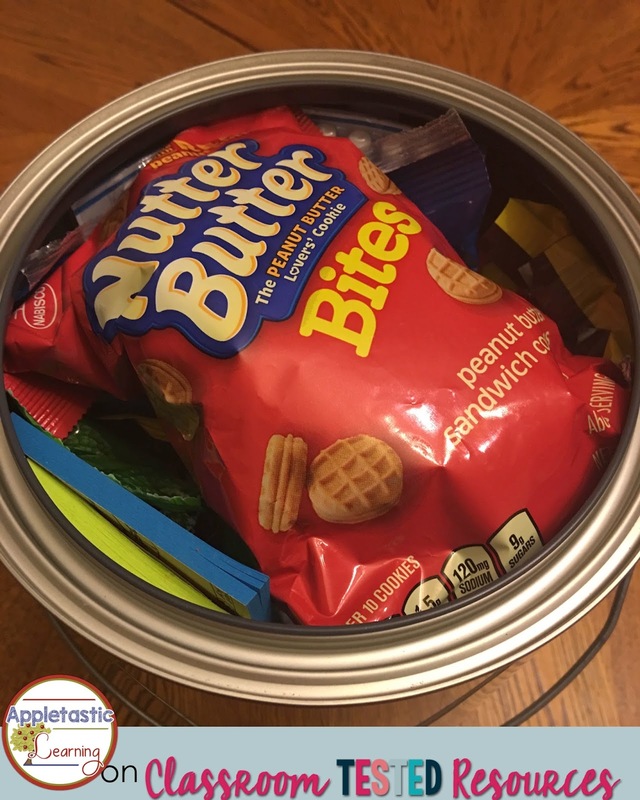 Once your can is filled, add your Back to School Survival Kit label. Glue the label to the front of the paint can. 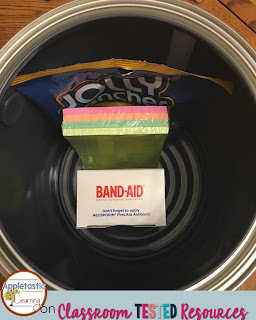 Once the label is neatly in place on your can, add some colorful ribbon. I chose some spare red ribbon I had left over from another project. I think it is perfect! 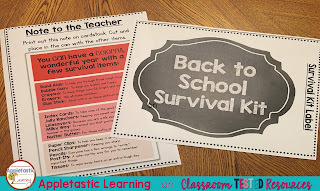 Now, the fun part: Give your Back to School Survival Kit to a lucky teacher! I can assure you that everyone will ask where it came from! Isn't it adorable? To download the FREE Back to School Survival Kit packet, click HERE. Thanks so much for visiting! I'd love to connect with you on my Facebook page, Appletastic: Blossoming in Fifth Grade! 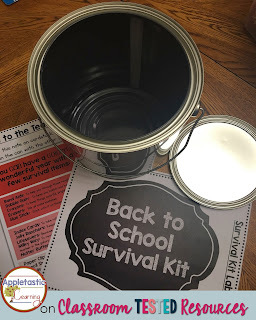 Such a cute idea for a back to school gift! 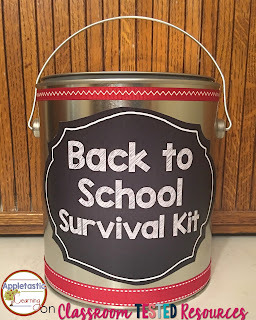 I'd love to get one of these to help me "survive" the beginning of school! Thanks for sharing.